2015 saw the maturing development of UHDTV 4K signal technologies and a growing agreement that both SDI and IP will exist in their respective strong application areas, as a solid engineering solution to the differing requirements of live signal handling and programme contribution. While the apparent panacea of one signal format appears attractive, the dependency of the live production sector on long-developed and keep-it-simple SDI infrastructure has made the extension of this technology into 4K and beyond a natural way to respond to viewers interest in high resolution and their take up of 4K TVs. While the IP landscape has yet to emerge from the mist, the adoption of 12G-SDI by a large number of manufacturers world-wide, has shown a strong desire to stay within a landscape that is recognisable. Fears and myths about 12G-SDI are being dispelled by industry leaders as they cut their teeth on this new technology and there is a broadening industry realisation that 75 Ohm cable is a dependable and rugged engineering solution for many 4K signal connections. With a large number of manufacturers adopting 12G-SDI as a viable way forwards, and more and more 12G-SDI equipment coming on the market, the need for a confident understanding of this new high speed SDI technology is becoming important for those embracing it. Some of the new challenges that are being overcome in the world of 12G-SDI are similar to those encountered when the industry moved to HD-SDI and 3G-SDI. These challenges, as with those of previous moves in technology require industry understanding and the tools to understand what the new norm is. Looking at the Eye Pattern of a 12G-SDI signal you will notice that, compared to HD-SDI or 3G-SDI, the waveform is basically a sine wave. Signal amplitude, rise time and fall time still have the same importance as before, but now the challenge is to see the Eye through the increased level of permitted jitter. T&M equipment that provides automatic measurement and a jitter-free Eye is essential here to be able to see the actual quality of the signal being generated. At this early stage of 12G-SDI development the most significant factor determining Eye quality is the current generation of driver chips. A significant advantage of having a jitter-free Eye Pattern display is that when the actual Eye closes it is due to the frequency response of the generating equipments output circuitry and the connecting cable to the measuring device. On a jittering display this cannot be seen. Jitter has always been present on SDI signals, due to the encoding method employed, but its effect has only be apparent in worst case scenarios such as low signal amplitudes caused by long unequalised cable runs, the use on non-re-clocking devices and intolerant receiving equipment. With 6G-SDI and 12G-SDI the permissible level of jitter has increased dramatically, but to counter this the current generation of receiver chips are highly tolerant to even greater levels of jitter. By its nature Jitter is random, so to ensure that the level of jitter introduced by generating is within SMPTE limits, it needs to be checked to ensure that there are no surprises when live video is used. When 6G-SDI and 12G-SDI technologies started to appear on the market there were concerns about the use of short cable lengths required to wire up equipment. Many organisations have already over-come this predicted limitation by converting between single 12G-SDI copper to quad 3G copper or fibre as necessary to suit their infrastructures. The conversion process can be challenging to get right, due to the complexities of the different SMPTE standards, but as long as factors such as Square Division to 2 Sample Interleave conversions, link timing and audio routing are checked all is well in the world. The remaining challenge for anyone embracing 4K / UHDTV and 12G-SDI, 6G-SDI, Quad Link 3G-SDI interface technology is finding the most appropriate 75 Ohm broadcast test and measurement equipment. For those with deep pockets, high end Real Time oscilloscopes are available. These, however, are typically 50 Ohm, non-broadcast-centric, complicated to use and do not necessarily provide the portability and durability required in most broadcast environments. The Omnitek Ultra 4K Tool Box provides a practical and useable tool set available for anyone working with 4K / UHD and using 12GSDI, 6G-SDI, 3G-SDI, DisplayPort or HDMI interfaces. 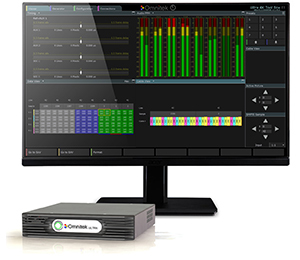 It provides consistent and reliable results using dedicated instruments directly applicable to broadcast equipment manufacturers, installers and testers.